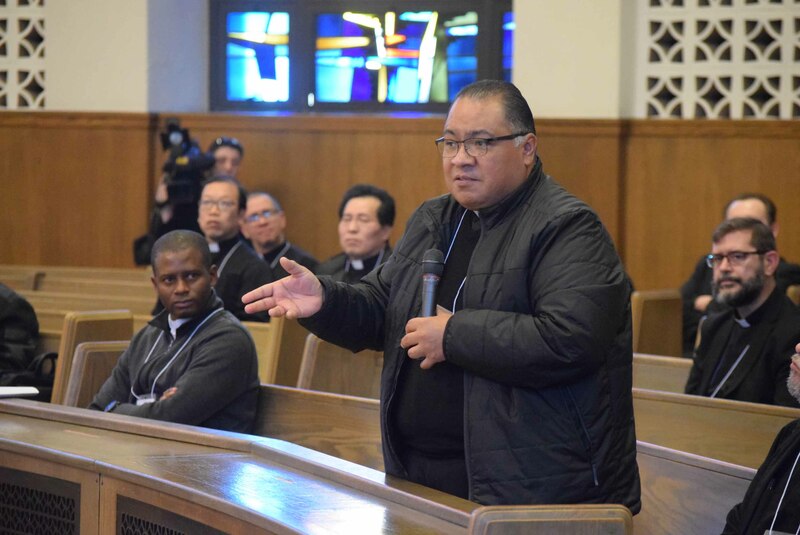 “International Priests,” as Bishop Nicholas DiMarzio referred to them, gathered at Immaculate Conception Center, Douglaston, for a day to ask questions and address any concerns they have. These non-incardinated priests of the diocese came together to discuss issues such as life in the diocese, Virtus training, guidelines for visas but also to share their stories with one another. Father Patrick Keating, CEO of Catholic Migration Services, led a seminar on migration and visa-related issues. Bishop DiMarzio opened the day with the Eucharistic adoration and a question-and-answer session in which he personally responded to inquiries. Many of these priests have been serving in the diocese for years while some are relatively new to the area. Nigeria, Ghana and India are some of the most common homelands for many of the men, while the rest come from Ireland, the Philippines, Poland, Colombia, Haiti, Congo, Mexico, Romania, Uganda and others. 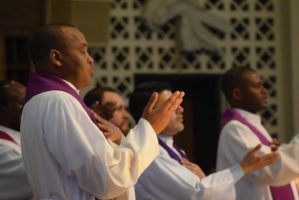 Non-incardinated priests provide a level of comfort for newcomers to the diocese who feel they have a priest of their own language, culture, and homeland to help bridge the gap between their homelands and their new residences. Auxiliary Bishop Raymond Chappetto, Vicar for Clergy, was the main celebrant of the Mass that concluded the day.He told the priests, “As the Vicar for Clergy, one of my responsibilities is overseeing you from the womb to the tomb, as I like to say. I am here to also assist you all in any way you need. There are many events that will take place that you all are invited to and will bring us closer together. It is a two-way street.